A police car has crashed into a bungalow during a chase in Lincolnshire, officers confirmed. Two officers in the marked vehicle were following a car which failed to stop when the collision happened at Hodson Close, Skellingthorpe, near Lincoln. A couple, who were inside the home at the time of the crash were not hurt. The two male officers were treated in hospital for minor injuries and released. 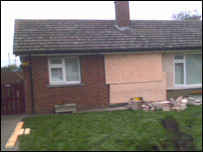 A 40-year-old man was later arrested on suspicion of burglary. Police said the car failed to stop for officers at the roundabout near Damon's restaurant on the A46, near Doddington on Tuesday night. They have appealed for witnesses to the collision to come forward.